Pastel on paper. 8" x 10"
​​​​​​​​Originally from the prairies of Minnesota, Gwen Nagel painted in oils as a teenager before beginning her formal study of art at the University of Minnesota. She switched majors, however, eventually earning a Ph.D. in English at Tufts University. Gwen taught writing and American Literature at Harvard Business School, Tufts, Bentley College, and the University of Georgia. She lived in the Boston area for twenty years, but on moving to Athens, Georgia, in 1991 she began to rekindle her love of painting. Since June of 1997 she has devoted herself full time to her art. 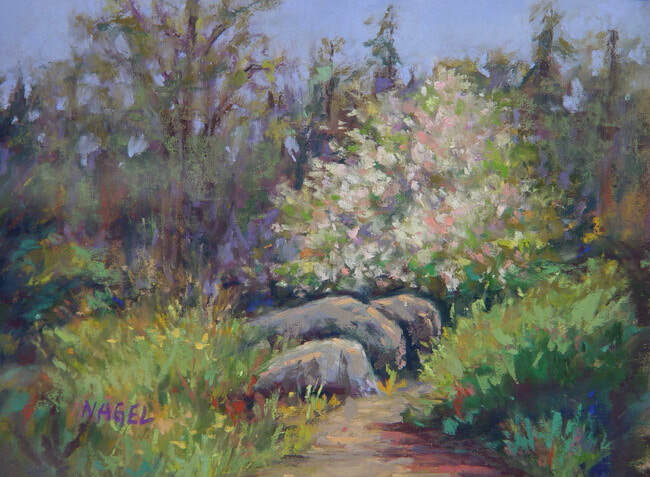 An artist friend in Maine introduced her to pastels and plein air painting a few years ago, and since then she has studied pastels with master pastellist Albert Handell of Santa Fe and has taken workshops in oil and watercolor with many nationally known artists. Her work is in galleries in the south as well as in Maine. The tonal qualities are Nagel's work are very soft and appealing.